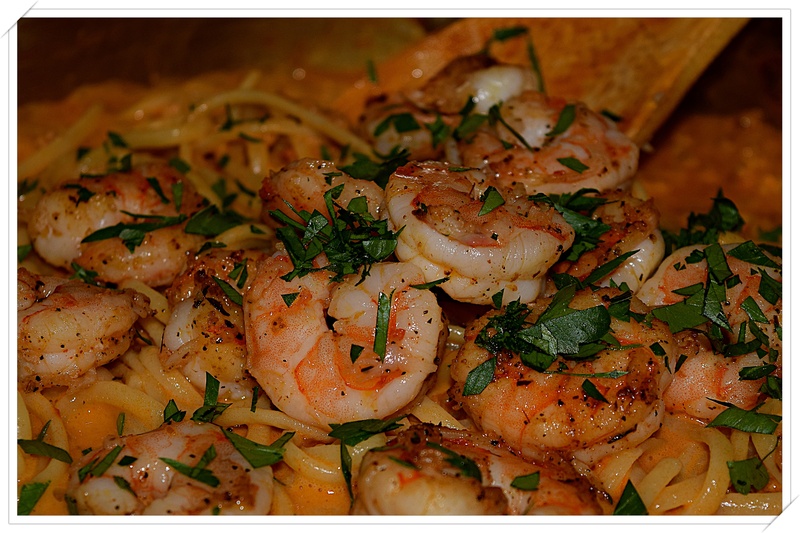 Adapted from Ruth Reichl’s Lost Recipes from Save me the Plums 4 this shrimp recipe was easy, delicious and adapted from a Marcella Hazan version using just a few ingredients, shrimp, white wine, smashed garlic cloves, good quality tomato paste, salt, pepper, and parsley. Besides flipping the shrimp cooking instructions I added a pinch or two of red pepper flakes. I skipped slicing the shrimp in half because half of it was going to be chopped and as for the rest, we like a good bite of shrimp not half of a shrimp. As for cooking the shrimp, I heat the oil and garlic until fragrant, removed it from the pan, sautéed the shrimp for a few minutes in the oil, and removed it to a bowl until time to add it back to the hot cooked sauce. I did process half of it and it also sad on the side until the sauce was finished. The recipe instructions are below…Mike likes a bit more sauce so I added another tablespoon of the tomato paste and another 1/4 cup of wine. Since I pre-sautéed the shrimp, I just continued with the sauce instructions and when finished I tossed the chopped shrimp and whole shrimp back into the sauce to heat through. Put the olive oil in a large saucepan over medium heat. Add the garlic and cook for a minute or so, until fragrant, about 2 minutes in all. Stir the tomato paste into the wine and add it, very carefully to the pan. Cook for about ten minutes, stirring from time to time. Add the shrimp, salt, and pepper and cook for a couple of minutes, stirring, just until the shrimp turn pink and lose their translucency. Take the pan off the stove.